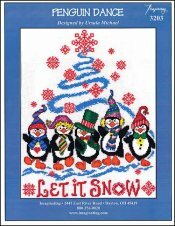 Penguin Dance [C5115] - $7.00 : Yarn Tree, Your wholesale source for cross stitch supplies. Cross stitch chart from Imaginating. Designed by Ursula Michael. Get your dancing shoes on! These five penguins, dressed for winter, are dancing in the snow. Scarfs, Santa hats, ear muffs & bowties are all apart of the winter apparel! Right flipper, left flipper, right flipper, left flipper...it's the "Penguin Dance." Stitch count 152v x 193h. Stitched on #2936 Zweigart Aida 14ct White 59" wide or #8221 Zweigart Aida 14ct White 43" wide.